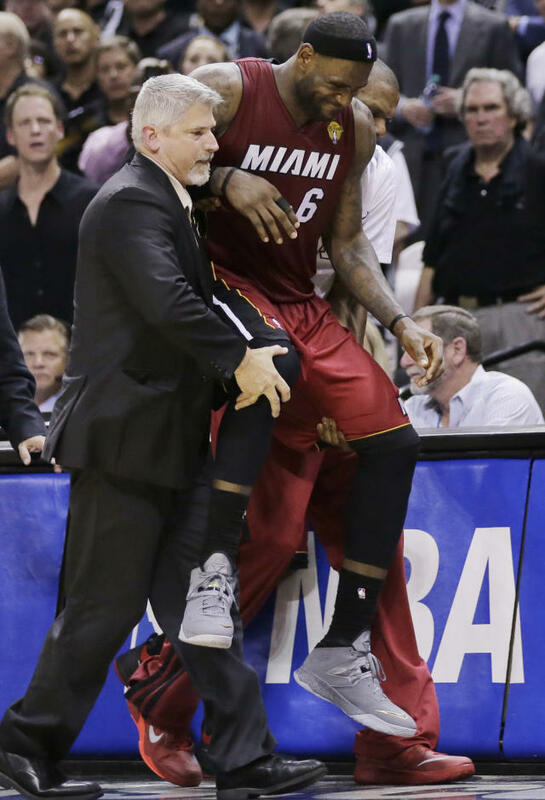 SAN ANTONIO – LeBron James was carried off the court. Just picked up and carried, his legs locked and immobilized due to cramps, his face in grimaced pain. He was either incapable or unwilling (in an effort to prevent further injury) to move. So here came his teammates out to rescue him during a stoppage of play in the NBA Finals opener, to haul him off the court so the Miami Heat didn't get penalized their final timeout. The San Antonio crowd could only watch in shock, many unsure whether to clap or not at a scene they never saw coming with this guy. That's a memory that won't be easy to erase. LeBron was a puddle, the sole casualty of a basketball game played in a sauna, the hot (nearly 90 degrees), humid and stagnant AT&T Center on a June, South Texas night when the air conditioning went out. 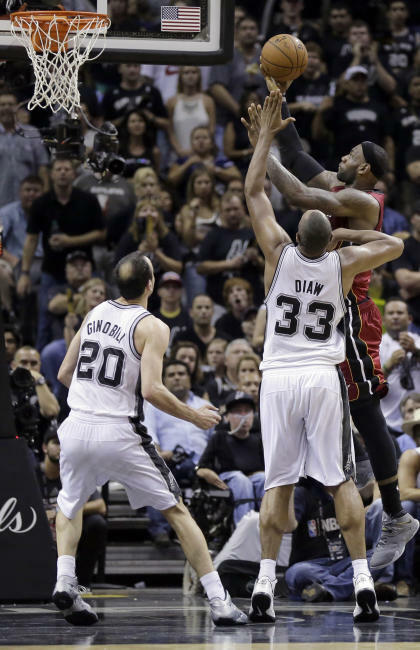 Thirty-eight-year-old Tim Duncan of the Spurs was fine (21 points, 10 rebounds). Thirty-eight-year-old Ray Allen of the Heat was too (16 points). The comparisons to Michael Jordan, Larry Bird, Magic Johnson and the other warriors of non-air conditioned gyms and flu-ridden Finals of the past came in and they weren't favorable. Just under four minutes to play in Game 1, the Spurs clinging to a 94-92 lead and LeBron was done, and his many, mostly silent-of-late critics were awakened into a full roar. The Spurs went on a 16-3 run to win going away, 110-95. Suddenly a comfortable-in-his-legacy LeBron finds his fourth consecutive trip to the Finals and search for a third straight title morph into his latest personal challenge. Win this thing or live with that image of a shutdown body being lifted off the court as part of the never-ending debate over his place in hoops immortality. Fair or not, this NBA Finals is now very much about LeBron James because no matter the reality of how a propensity to cramp is the sole known downside to having a 6-foot-8, 265-pound body capable of playing all five positions on the court, no one was spending any time postgame defending him. "Look," Spolestra said, "both teams had to do it, we're not making excuses." Instead Miami pointed to poor defense (the Spurs shot 58.8 percent from the floor), bad defensive rotations in crunch time sans-LeBron, and its 16 turnovers. The heat, they actually reveled in. LeBron's faltering, after scoring 25 points and grabbing six rebounds, was shrugged off. Who needs AC? Ray Allen said it reminded him of his non-air conditioned high school gym back in Dalzell, South Carolina. "I loved it," Allen said. "… I felt right at home. Keeps my body loose." Shane Battier pointed to his college days at Duke, where Cameron Indoor Stadium at the time was left to the elements – and heated by tightly packed Cameron Crazies. "It didn't bother me," Battier said. "It was that hot in Cameron Indoor every single game. It was a huge, huge advantage. Ten thousand people on you, no AC." The Spurs' Tony Parker went with his days back in France and across the European leagues. "We never have AC in Europe," Parker said, "so it didn't bother me at all." Even Dwyane Wade just shrugged. Heat and humidity isn't normally part of the NBA these days, but the game is the game. "If you play basketball," Wade said, "you play basketball where it's hot like this. I think everybody has done it before." This sounded like a parade of tough guy talk radio callers wanting to bolster themselves with the illusion of being stronger than LeBron. Only it was James' teammates and peers, and that's why this won't be easy to shake. Physically, with Game 2 not coming until Sunday, LeBron will recover. Image wise, he's back to getting bashed like back before he became a champion. "Everybody was tired," the Spurs' Danny Green said. "Everybody was sluggish." No sympathy. Just high stakes. In the Heat's sweltering undersized visiting locker room here – even more uncomfortable than out in the arena – James wasn't around, off getting treatment, his clothes cleared out leaving nothing but a lonely coat hanger swinging under a humble piece of athletic tape with a "6" scribbled on it. He was left speaking to an NBA pool reporter. "It was the whole left leg," LeBron said of his final cramps. "Damn near the whole left side … the best option for me was not to move. I tried and any little step or nudge, it would get worse. It would lock up worse and my muscles spasmed 10 out of 10. "… It's frustrating and anger, but at the same time it's something that you try to prevent, you try to control. I mean, I got all the fluids I need to get, I do my normal routine I've done." Only neither he nor the Heat training staff could have envisioned such an environment. They thought the AC would work. "It was inevitable for me tonight," James said. "Throughout the conditions, you know, out there on the floor." Everyone knew the danger when it became apparent something was amiss during the first quarter as temperatures began to rise and spectators turned programs into cheap fans. At halftime James (like the others) was pumped full of liquids. He changed into a new uniform. During a timeout he was draped in freezing towels and had bags of ice placed on his legs and neck. "It was frustrating sitting out and not be able to help our team," he said. Now comes the latest challenge to LeBron, a comical and unfair questioning of his core competitiveness, but one that is unavoidable now, especially in today's media cycle. No he shouldn't have to prove anything. Yet his critics desperately hope he can't. Duncan played. Allen played. Wade played. MJ played with the flu (even if that's nothing like this). Magic Johnson tweeted how Finals games like this were common back in the '80s, back in the old Boston Garden. That's when Larry and he were at their best, after all, rising to the challenge. LeBron didn't rise. LeBron couldn't rise. LeBron was carried off the court in a way the other all-timers never did. Whether it's rational or not, a Finals that he entered with little to prove is again turning into some kind of old referendum on just who LeBron James is.